Posted December 7, 2018 by Andrea Laford & filed under General, Headlines, News, Spoilers. According to The Mirror there will be a new, redesigned version of the Daleks in the Doctor Who New Year’s special. 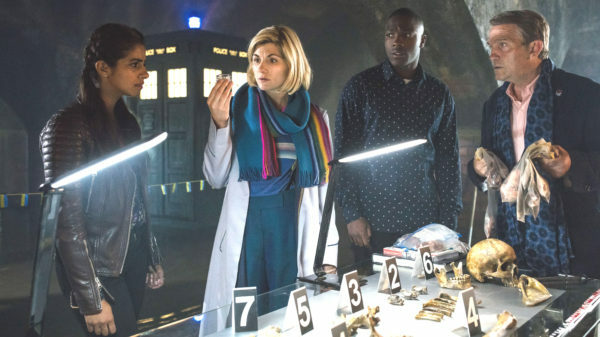 How did Chris Chibnall “play cute” with the press? Neither of the above news sources could name the yet unannounced title of the Doctor Who New Year’s Special nor could they give a more detailed synopsis of the events of the special. Are the Dalek rumors true? It’s possible The Mirror’s source could be conflating information gained from reports of public filming, though they did not identify the nature of their source. This is what CultBox knows of the two weeks of filming Chris Chibnall mentioned. First, a photo of something that some said resembles a Dalek on a prop sign outside Cathays Llywodraeth Cymru offices in Cardiff. It looks more like BB8 from Star Wars to me. If this is the alleged Dalek redesign, Disney might have something to say about that. Some more filming took place the following day, July 30, at the smart bridge opposite the Atrium building at Cardiff University. It’s worth noting that some or all of director Wayne Yip’s filming of the New Year’s special overlapped the last Series 11 filming block which contained the series finale. However, the scenes filmed on July 29 and 30 take place on modern-day Earth and don’t resemble publicity photos depicting the planet Ranskoor Av Kolos. The Doctor Who New Year’s Day Special airs on January 1, 7:00 p.m. on BBC One and 8:00 p.m. on BBC America.